David Bowie was born September 16, 1965. Actually, that's the day that the 18-year-old David Jones legally assumed the name that became famous. This is one piece of minutiae that you can glean from the blockbuster exhibit, David Bowie Is, at the Museum of Contemporary Art through January 4. The exhibit fills the fourth floor of the museum and demonstrates far more than minutiae... and shows Bowie as far more than a musician. He is a cultural prodigy, knowledgeable and expert at art, design, theater, writing and music. 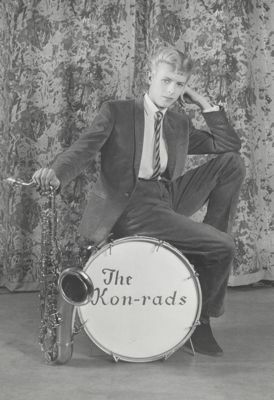 Bowie had been performing as David Jones or Davie Jones since he was 15. (He changed his name partly to distinguish himself from Davy Jones of the Monkees.) Even as a young teen performer, he was concerned about his image and identity. He designed business cards and stage sets for his band, The Kon-Rads. Throughout his career, he took almost obsessive control over every aspect of his performances, hiring noted designers to create the costumes and stage sets that he sketched out on paper. In addition to creating 35 studio and live albums and making 14 worldwide tours, he painted and acted on stage and in films. Bowie has also been obsessive about saving items from his career, which explains why the David Bowie archive in New York has some 75,000 items stored, organized and managed by a full-time archivist. The current exhibit was developed by the Victoria and Albert Museum in London; Chicago is the only US location where it will be exhibited. How did the MCA manage to secure this exclusive slot in the tour? I asked that question at the press preview the week before the exhibit opened. 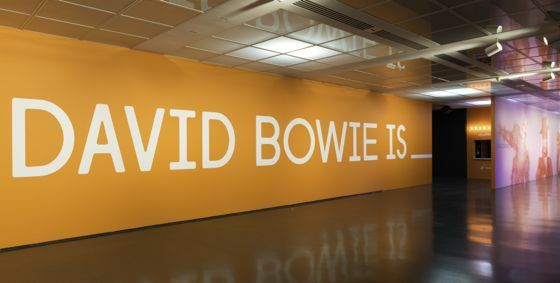 The answer was simple, according to MCA curator J. Michael Darling. "We called up the V&A and asked if they would bring it to Chicago." And the answer was yes. The exhibit has appeared in Toronto, São Paulo and Berlin and moves next to Paris and Melbourne. The show is not a retrospective; the curators make that point. Bowie is still a working artist, even though his output has slowed recently. Nor is it in any way a critical examination of his work. It's a comprehensive display of everything he's done since he was a child, with costumes, costumes, costumes. The large exhibit is laid out as a timeline of his life, influences and career. (The V&A exhibit was designed thematically, rather than chronologically.) When you enter, you receive a headset and location-sensitive controller that plays the appropriate music and audio clips as you move through the exhibit. This immersive multimedia technology by Sennheiser is very advanced. (I usually don't like to use the audio sets when I visit a museum, but in this case, it's important to do so.) Near the end of the exhibit is a large gallery with Bowie videos playing on four walls in 3D sound that fills the room; take off your headset here. The exhibit takes the viewer from the arts and artists that influenced Bowie as a child and teenager, his education and first bands as a teenager. Although he didn't go to art school, the secondary school he attended emphasized the arts. When he was 16, his art teacher arranged for him to get a job as a "paste-up artist" doing advertising layouts for an agency in the city. His 12 months in this job got him out of the suburbs and exposed him to current theories on mass marketing (and what we now call branding). After playing with a series of bands, Bowie was influenced by events of 1969 and gained his first major hit with "Space Oddity" in 1969 ("Ground control to Major Tom....") His appearance on the BBC show "Top of the Pops" in 1973 cemented his success when he enthralled fans and outraged others with his performance of "Starman," in a vividly colored two-piece quilted costume, makeup and flirtatious behavior with guitarist Mick Ronson. 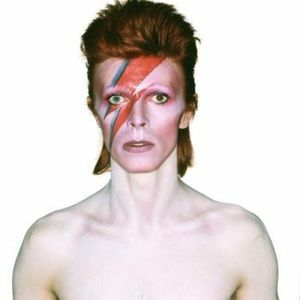 He took on the persona of the alien Ziggy Stardust, which resulted in one of his most successful albums, Ziggy Stardust and the Spiders from Mars. Throughout his career, he constantly reinvented himself musically and stylistically. "I'm out to bloody well entertain, not just get up on stage and knock out a few songs. I'm the last person to pretend I'm a radio. I'm a color television set." 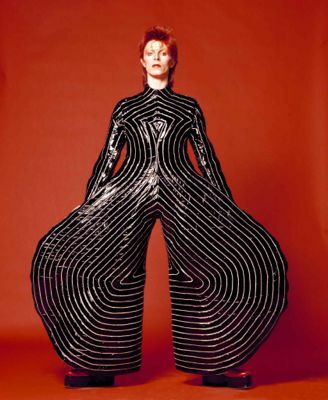 The exhibit shows Bowie's identity changes over the years through more than 60 stage creations -- suits and bodysuits by well-known designers -- as well as jewelry, shoes and accessories. In every period, displays include videos, handwritten lyrics and setlists and hand-drawn sketches for costumes and stage sets. Oh, and the coke spoon is there too. One of the treasure troves is the replica of a music store record bin, filled with Bowie album covers. The audio sets provide interviews with Bowie, his critics and collaborators, as well as his music. Don't miss the viewing room where you can see clips of Bowie in films such as Basquiat, The Man Who Fell to Earth, The Prestige and Labyrinth. There is also a clip from his performance in the title role in the stage version of Elephant Man, which opened at the Blackstone Theatre in Chicago in 1980 and later went to New York. David Bowie Is is not just an exhibit for fans of his music or for fans of rock and roll. It's an exploration of history and popular culture transmuted through the vision of one artist, who probably deserves to be called a genius. 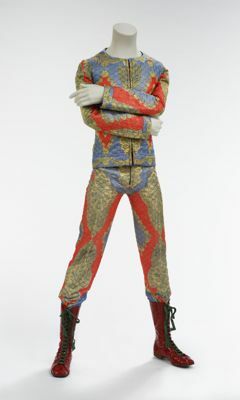 David Bowie Is will continue at the Museum of Contemporary Art, 220 E. Chicago Ave., through January 4. The museum is closed Mondays and has extended hours for the exhibit. Timed tickets are $25, which includes general admission to the museum. See the website for hours and ticket-buying information. Allow one and a half to two hours to view the exhibit thoroughly. All images courtesy the Museum of Contemporary Art or the Victoria and Albert Museum.